We’d love your help. Let us know what’s wrong with this preview of Origin Story by David Christian. To ask other readers questions about Origin Story, please sign up. How does this book compare to having read both Sapiens by Harari, and A Short History of Nearly Everything by Bryson? Short history: This book focused a lot more on evolution of modern science and had some great stories about major inventions and discoveries over the last 250 years in great detail. I felt like the early cosmology aspects were given short shrift. Bryson can be engaging but also a bit tedious. Origin: Does the best job of unifying various aspects of knowledge from cosmology to modern science to anthropology. I enjoyed the analysis of "threshold moments", right from the big bang, creation of stars, galaxies, planets, evolution of life, the breakneck evolution over the past 200 years and a little peek into potential futures. Christian's writing style is not the most interesting but boy, does his content make up for it! We all have an origin story. In some societies, they manifest as creation myths. In others, they look more like history textbooks. For example, as a kid in the United States, I grew up learning about the group of rebels who stood up to their British overlords and founded our country. It’s human nature to be curious about where we come from, and origin stories unite people through a common history and shared sense of purpose. But what if all of humanity shared an origin story? What would that stor We all have an origin story. In some societies, they manifest as creation myths. In others, they look more like history textbooks. For example, as a kid in the United States, I grew up learning about the group of rebels who stood up to their British overlords and founded our country. It’s human nature to be curious about where we come from, and origin stories unite people through a common history and shared sense of purpose. But what if all of humanity shared an origin story? What would that story look like? Historian David Christian tries to answer those questions in his new book Origin Story. As the creator of Big History—my favorite course of all time—David is well-suited to write about how we came to be. Big History tells the story of the universe from the big bang to the first signs of life to today’s complex societies. It shows how everything is connected to everything else, weaving together insights and evidence from across disciplines into a single, understandable narrative. Origin Story is essentially the Big History course condensed into a short book. It divides 13.8 billion years of existence into what David calls “thresholds”—moments in history that mark key transition points, like the formation of our solar system and the first appearance of early humans. The chapters about the early thresholds are heavy on physics and chemistry, but it skews more towards biology and anthropology as single cell life evolves into more complex beings. 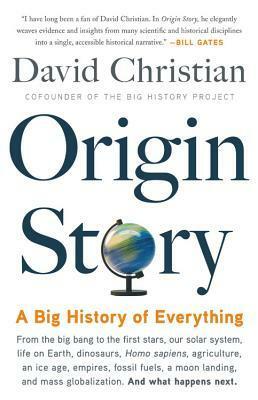 If you haven’t taken Big History, Origin Story introduces you to its concepts in a straightforward, understandable way. David is a very good writer, and he has a way of making complicated subjects fun. If you’re already a Big Historian, Origin Story is a great refresher. It does a fantastic job distilling the latest thinking about the origins of the universe. I learned some things that are simply too new to be included in the course. loved this. Had the most wonderful sense of the sublime while reading it; I'm tiny and unimportant and my specific life could not matter less. Christian's framing of 21st-century power in terms of cell structures has made me deal better with my anxiety about how fucked the world is, and my fears for humanity in the near future. Excellent writing, about the only topic there is, really. The first thing I have done after finishing the book is to unlike Bill Gates' review (4/5) of it. I also suspect if he reviewed and recommended this not because he personally found it great, but because he wanted others to read it as a good, lucid introductory book on Big History. The first half of the book is a poor cousin of "Cosmos" or "A Short history of Nearly Everything". It deals with the origin of the universe to the origin of human beings. The book has more information than insights and The first thing I have done after finishing the book is to unlike Bill Gates' review (4/5) of it. I also suspect if he reviewed and recommended this not because he personally found it great, but because he wanted others to read it as a good, lucid introductory book on Big History. The first half of the book is a poor cousin of "Cosmos" or "A Short history of Nearly Everything". It deals with the origin of the universe to the origin of human beings. The book has more information than insights and for this part, the book felt a bit better. Couldnt help comparing the second half, the story of humans, to the magnificient "Sapiens" by Harari. Instead of insights you have a lot of children's general history level facts thrown at you here. It was so uninteresting that I skimmed the last chapter. This was good, definitely good but just so. Felt more of a concoction of already familiar works of some of the famous historians, scientists, biologists and anthropologists. این کتاب که فکر کنم هنوز به فارسی ترجمه نشده و سال گذشته نوشته شده به مرور تاریخ زمین و بشر از ابتدا تا اکنون پرداخته. مسلما قسمت های زیادی وجود داره که نویسنده تنها یکی از نظریه های موجود رو در نظر گرفته و از بحث در مورد سایر نظریه ها به هر دلیلی چشم پوشی کرده. این قسمت ها مخصوصا در اوایل کتاب در ذوق می زند. اما همه چیز بعد از آخرین عصر یخبندان که ده هزار سال پیش تمام شده به شدت جذاب میشه. همچنین به واسطه مستندات باستان شناس ها مباحث مرتبط در این قسمت قابل قبول تر و دل نشین تر شدند. مهمترین عامل این کتاب که فکر کنم هنوز به فارسی ترجمه نشده و سال گذشته نوشته شده به مرور تاریخ زمین و بشر از ابتدا تا اکنون پرداخته. مسلما قسمت های زیادی وجود داره که نویسنده تنها یکی از نظریه های موجود رو در نظر گرفته و از بحث در مورد سایر نظریه ها به هر دلیلی چشم پوشی کرده. این قسمت ها مخصوصا در اوایل کتاب در ذوق می زند. مهمترین عاملی که از آغاز تا اکنون تعیین کننده بوده بحث انرژی است. انرژی بود که باعث شد انسان اولیه به کشاورزی روی بیاره و همون کشاورزی بود که اونها رو ساکن کرد و تمدن و شهر ها شکل گرفت و بعدها انرژی سوخت های فسیلی بود که به رشد بشر سرعت داد. کاملا قابل درک هست که سرنوشت انرژی در آینده سرنوشت نسل بشر رو تعیین کنه. اما همه چیز به این سادگی هم پیش نرفته و نمیره. تولید انرژی بیشتر و مصرف انرژی بیشتر یک خروجی بد داره و اون افزایش انتروپی و گرم شدن زمین است که اگر بشر مثل بقیه مشکلاتش براش فکری نکنه در آینده ای که دور نیست با مشکلات بدی رو برو میشه. I want to read more good nonfiction, and came across this intriguing title - it fit the bill nicely, giving me a new cautiously optimistic outlook and taking my mind off of the dreadful news headlines for a bit. First of all, I really enjoyed the dry humor and interesting observations of the author. He uses the term Goldilocks to refer to the just right evolutionary conditions planet Earth possessed which allowed life to develop. The following passage is typical of his engaging style, in which he I want to read more good nonfiction, and came across this intriguing title - it fit the bill nicely, giving me a new cautiously optimistic outlook and taking my mind off of the dreadful news headlines for a bit. See? Different and intriguing, yet accessible. And I admit, when I read the above statement about nobles squeezing peasants, I thought of my favorite scene from Monty Python and the Holy Grail where King Arthur (Graham Chapman) is treated to a lecture on human rights from a peasant! Multidisciplinary look at the modern origin story of humankind. It begins with the big bang (astrophysics, quantum mechanics, etc.) and talks about star formation and planet formation. Then it goes on to discuss the history of earth and of life on earth (biology, chemistry, geology, etc. ), all the way through present times (economics, history, sociology, etc.). It finishes up by looking at possible futures for us and the universe as a whole. I don't normally get as engaged with non-fiction books, Multidisciplinary look at the modern origin story of humankind. It begins with the big bang (astrophysics, quantum mechanics, etc.) and talks about star formation and planet formation. Then it goes on to discuss the history of earth and of life on earth (biology, chemistry, geology, etc. ), all the way through present times (economics, history, sociology, etc.). It finishes up by looking at possible futures for us and the universe as a whole. Scary stuff. Really scary, and important, and informational. This is science that everyone needs to understand. If you follow creationist theories, just skip over the bits on evolution. There is still some good information in here that won't go against your beliefs. Now, in the early 21st century, we know far more about the origin of the universe, our sun, our planet, and life on Earth. We live in a society of unparalleled complexity, and in the last two hundred y Every culture and tradition has had its origin story, its understanding of how the world came to be as they knew it, which formed the basis for their further understanding of how to live, interact with others, get food, make clothes. Our origin stories are the basis of how we understand everything. Great book. Especially the history of Earth is delivered in very cohesive and clear way. The one star down is for a bit repetitive covering of industrial era. Otherwise this should be a history book in school to understand the history of our planet. Having read Dr. Christian's previous text on Big History, Maps of Time, as well as having studied his course on Big History produced by The Great Courses (previously known as The Teaching Company), I found this an enjoyable refresher. It is a more condensed version of Big History than the massive Maps of Time and is an excellent introduction to whet the appetite of potential students. Anyone who knows me is aware of my tendency towards OCD behavior in reading, in that I am obsessive about readin Having read Dr. Christian's previous text on Big History, Maps of Time, as well as having studied his course on Big History produced by The Great Courses (previously known as The Teaching Company), I found this an enjoyable refresher. It is a more condensed version of Big History than the massive Maps of Time and is an excellent introduction to whet the appetite of potential students. Anyone who knows me is aware of my tendency towards OCD behavior in reading, in that I am obsessive about reading a series of books in the order they were written. The study of history is one of my major loves, so Big History satisfies that obsession by taking us back to what we currently believe to be the very beginning of it all: the Big Bang. The story continues as levels of complexity increase (e.g. stars, planets, molecules, etc. ), eventually leading to the emergence of mankind. This book includes a large concluding section dealing with the present-day changing of the biosphere by humans and what the future could hold. It's a relief that Dr. Christian is neither a predictor of doom and despair nor a believer that everything is rosy. He presents a fair depiction of the choices we face in the future of life on earth. The Origin Story is a great summary of David Christian's Big History Project - a field of study that integrates concepts from diverse silos of knowledge in order to explain the rising complexity in the universe – the pinnacle of which is represented by the human race. Through this story we come to terms with our chance existence, despite the law of entropy which predicts that disorder of a closed system should only increase. Each threshold – where something new emerges – requires more energy and The Origin Story is a great summary of David Christian's Big History Project - a field of study that integrates concepts from diverse silos of knowledge in order to explain the rising complexity in the universe – the pinnacle of which is represented by the human race. Through this story we come to terms with our chance existence, despite the law of entropy which predicts that disorder of a closed system should only increase. Each threshold – where something new emerges – requires more energy and a more improbable set of goldilocks conditions. This book takes us on 13.8 billion year journey through several thresholds - from the big bang, to the creation of the first atoms, to the biological formation of the first cells and DNA, to the evolution of cultural complexity resulting from the industrial revolution. Each step is marked by an increased need for free energy flows and increased fragility because of the more stringent conditions within which their existence is possible. The book highlights the common thread connecting all of us with the universe. We are all made up of congealed energy (atoms) – just like the stars, the planets, the oceans, the animals and the devices we create. We simply represent a more improbable and energy intensive arrangement of particular atoms. Our death may be the end of our story, but not the end of the parts that make us. In the broad narrative of the universe, we may be the most complex creatures, but we occupy an insignificant slice of time in the journey of the universe. Our continued existence is far from certain – in fact it is highly improbable. An asteroid or a volcano could destroy us. We could run out of energy. A biological virus could destroy our civilization. Humanity may evolve into a super race or be destroyed by one. The climate may run amok – like on Venus. The challenges that face us are immense, but so is our ability to find solutions. – Early Hominin History: When Did the First Humans Appear? 12. Where Is It All Going? History bored me as a child. Who wants to know about kings and wars and dates? As I grew older, I realized that knowing how we got to today is a key part of understanding today as well as future. In Origin story, Christian offers a solid, all-encompassing scaffolding for everything we know as a species today. This book touched me deeply in offering a moment of complete AWE at how complex, vast and interconnected everything in the universe is. Magnum opus extraordinaire! The book narrates big his History bored me as a child. Who wants to know about kings and wars and dates? As I grew older, I realized that knowing how we got to today is a key part of understanding today as well as future. In Origin story, Christian offers a solid, all-encompassing scaffolding for everything we know as a species today. This book touched me deeply in offering a moment of complete AWE at how complex, vast and interconnected everything in the universe is. Magnum opus extraordinaire! The book narrates big history as a sequence of "threshold moments", that were crucial turning points in a journey of increasing complexity. I've read other books in this format that dissect specific parts of history (Sapiens for evolution of humanity, Brief History of Time for cosmology etc.) but this book takes a panoramic perspective of all of time. Threshold 5: Life emerges on Earth (4 billion years ago) Prokaryotes->Eukaryotes. Photosynthesis & Respiration create energy bonanzas. This book is obviously a remarkable effort. It attempts to capture "Big History" right from the moment of the Big Bang until the present. Then, it attempts to give a glimpse of the future as the universe tumbles towards its end as we know it. However, the main reason I did not enjoy this (as much as I wanted to), was because this feels too similar to a lot of books I've already read. 2. Sapien This book is obviously a remarkable effort. It attempts to capture "Big History" right from the moment of the Big Bang until the present. Then, it attempts to give a glimpse of the future as the universe tumbles towards its end as we know it. ... then you've pretty much read everything that this book covers. Although, I admit, there is some value in a book that brings all of this together in one place. One other minor criticism of the book is that in the chapter covering the Anthropocene (2nd to last chapter), the author wastes a lot of time repeating the same points over and over again. Perhaps the intention is to highlight how important the lessons are, but in practice, the chapter was tedious to read. Other than that, this is a reasonable book to read, if you are unlikely to read the other 3 books I mentioned above. - "Study the world itself rather than what has been said about the world." I have read quite a few histories and even translated a few, especially when it comes to the origin and evolution of the universe. Big Histories or Histories of Everything are in truth nothing new, although it seems they are going through a sort of re-emergence, usually ending with informed guesses on humanity's future. It seems the goal is to put forward the idea of a unified human race (or at least, essential history thereof), the likes of which is depicted and will eventually be established in I have read quite a few histories and even translated a few, especially when it comes to the origin and evolution of the universe. Big Histories or Histories of Everything are in truth nothing new, although it seems they are going through a sort of re-emergence, usually ending with informed guesses on humanity's future. It seems the goal is to put forward the idea of a unified human race (or at least, essential history thereof), the likes of which is depicted and will eventually be established in a 100-300 year Star Trek future (in terms of society, not starfaring technology). It is a lovely idea, albeit one that does not seem very realistic given the state of the world and the fact that some such efforts (such as this book) are being made in what is ostensibly "the Western World", like drops in an ocean of radicalization, fragmentation and insularity. I love reading about the big picture and where things come from. It gives you an appreciation for what we have now and where we're going. I've always wondered how people can be so sure what existed before they were born. Without personal experience, everything is a guess, and who's to say we didn't all get beamed down here by an alien race? This book does not disappoint. It goes as far back as science dares to go and gives a step-by-step recounting of the best guesses out there about how things I love reading about the big picture and where things come from. It gives you an appreciation for what we have now and where we're going. I've always wondered how people can be so sure what existed before they were born. Without personal experience, everything is a guess, and who's to say we didn't all get beamed down here by an alien race? This book does not disappoint. It goes as far back as science dares to go and gives a step-by-step recounting of the best guesses out there about how things came to pass. Since most history classes focus on the last 300 years, plus a quick look at Rome, Egypt, and Greece, this book will expand greatly the history that led us to those points. The author uses Physics, Chemistry, Biology, Anthropology and Historic records to show a timeline that agrees with data from around the planet. We're lucky to be among the few in history to be able to see such a big picture. Hopefully we can do something with it. The final chapter delves into the future, covering a lot of the ecological dilemmas that face us now. A great book for those who want to see the BIG picture. I was fascinated by a soaring manner of the author to explain complex concepts in simple terms. The book covers many topics belonging to the humankind's origin story starting with the big bang and ending with future challenges such as scarcity of energy resources and others. I really liked the ideas encompassing subsistence of all complex structures in the universe, entropy taxing, trophic strata of energy consumption, etc. I have never known about such a general view on a composition of the uni I was fascinated by a soaring manner of the author to explain complex concepts in simple terms. The book covers many topics belonging to the humankind's origin story starting with the big bang and ending with future challenges such as scarcity of energy resources and others. I really liked the ideas encompassing subsistence of all complex structures in the universe, entropy taxing, trophic strata of energy consumption, etc. I have never known about such a general view on a composition of the universe and it was great to conceive such an insight. -The Big Bang created the Universe 13.8 billion years ago, the first of a series of key events in our history. -The appearance of stars 12 billion years ago and the way they die were important steps forward for the universe. -The earth was formed by the accumulation of debris about 4.5 billion years ago. -Earth had the right conditions to allow life to flourish. -Photosynthesis was an energy bonanza for early, single-celled life that helped spark a biological revolution. -Evolution and the extinctio -The Big Bang created the Universe 13.8 billion years ago, the first of a series of key events in our history. -Evolution and the extinction of dinosaurs helped the big forms of life develop that would eventually lead to humanity. -Humans evolved from primates and made a major breakthrough with the development of language. -Farming was a transformative innovation for human life. -As farming improved, it generated surpluses which enabled the development of more complex agrarian societies. -The exchange of ideas and discovery of fossil fuels accelerated the advance of human progress. -The earth has entered a new age: the era of humans. David Gilbert Christian is an Anglo-American historian and scholar of Russian history notable for creating and spearheading an interdisciplinary approach known as Big History. He grew up in Africa and in England, where he earned his B.A. from Oxford University, an M.A. in Russian history from the University of Western Ontario, and a Ph.D. in 19th century Russian history from Oxford University in 1 David Gilbert Christian is an Anglo-American historian and scholar of Russian history notable for creating and spearheading an interdisciplinary approach known as Big History. He grew up in Africa and in England, where he earned his B.A. from Oxford University, an M.A. in Russian history from the University of Western Ontario, and a Ph.D. in 19th century Russian history from Oxford University in 1974. He began teaching the first course in 1989 which examined history from the Big Bang to the present using a multidisciplinary approach with assistance from scholars in diverse specializations from the sciences, social sciences, and humanities. The course frames human history in terms of cosmic, geological, and biological history. He is credited with coining the term Big History and he serves as president of the International Big History Association.